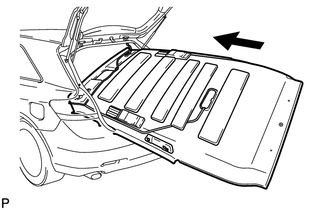 (a) Pull the roof headlining assembly into the vehicle through the back door. (c) Connect the No. 2 antenna cord sub-assembly connector and washer hose to the rear pillar RH. (d) Connect the No. 2 antenna cord sub-assembly connectors and washer hose, and engage the 5 clamps to the front pillar RH. (1) Connect the No. 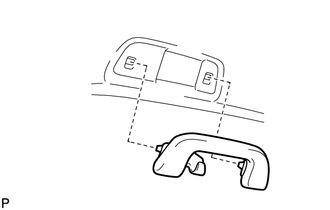 1 roof wire connector to the inner rear view mirror. (f) Connect the No. 1 roof wire connectors and engage the 4 clamps to the front pillar LH. 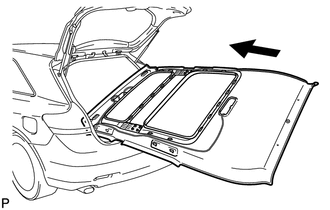 After installation, make sure that the back door weatherstrip does not interfere with the roof headlining assembly. (b) Engage the 23 fasteners. (c) Install the 3 clips. (d) Connect the No. 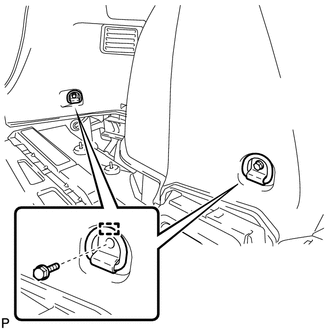 2 antenna cord sub-assembly connector and washer hose to the rear pillar RH. (e) Connect the No. 2 antenna cord sub-assembly connector and washer hose, and engage the 5 clamps to the front pillar RH. (f) Connect the No. 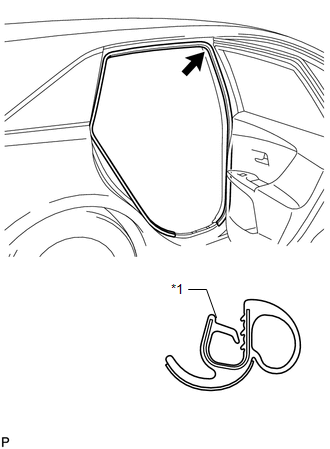 1 roof wire connector to the inner rear view mirror. (g) Connect the No. 1 roof wire connectors and engage the 4 clamps to the front pillar LH. 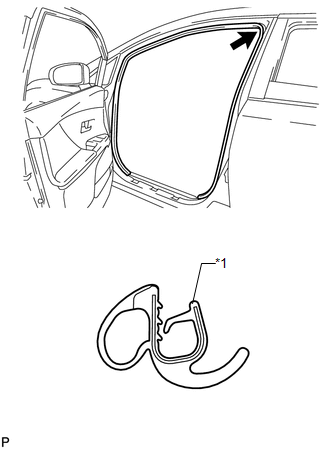 (b) Push in the visor holder as shown in the illustration. 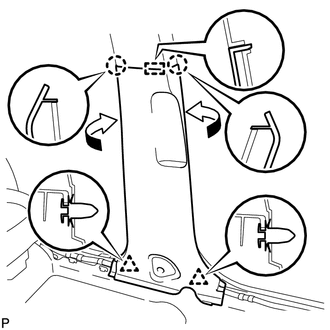 (a) Assemble the assist grip sub-assembly as shown in the illustration. 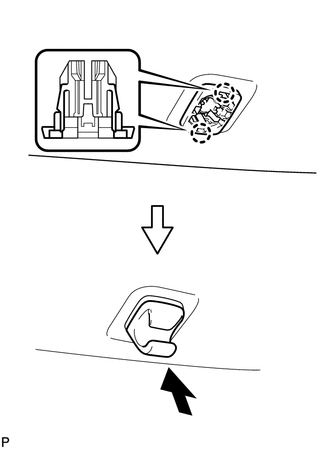 (b) Install the assist grip sub-assembly. 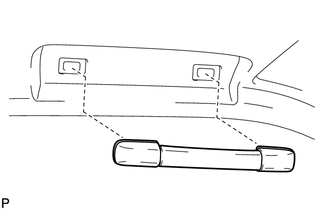 (a) Assemble the rear assist grip assembly as shown in the illustration. 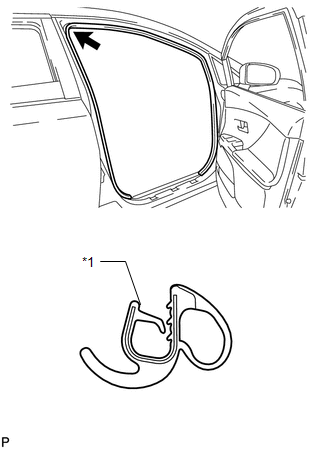 (b) Install the rear assist grip assembly. (a) Install the visor assembly LH with the 2 screws. (a) Engage the 4 claws and install a new visor bracket cover. 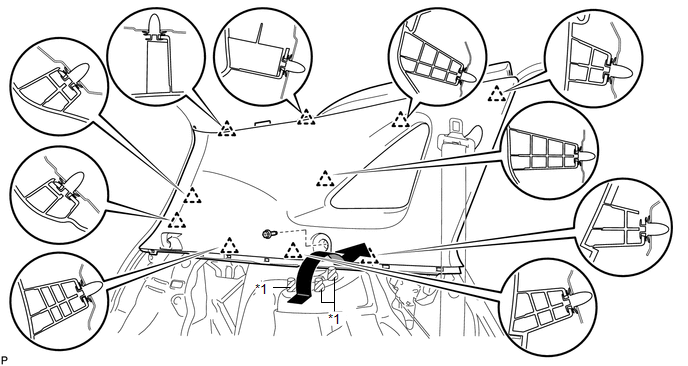 (a) Pass the floor anchor of the rear seat outer belt assembly LH through the roof side inner garnish assembly LH. (b) Insert the upper edge of the roof side inner garnish assembly LH into the roof headlining. 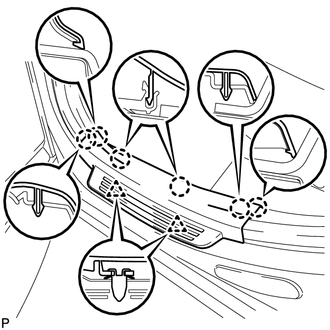 Lift the lower edge of the garnish up and push it in over the 3 stud bolts while ensuring ample clearance. 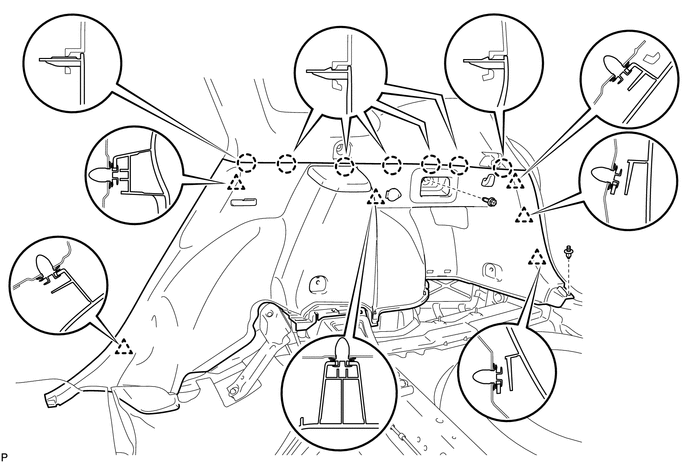 (c) Engage the 10 clips to install the roof side inner garnish assembly LH with the bolt. (d) Remove the applied protective tape. (b) Engage the 7 claws and the 5 clips. 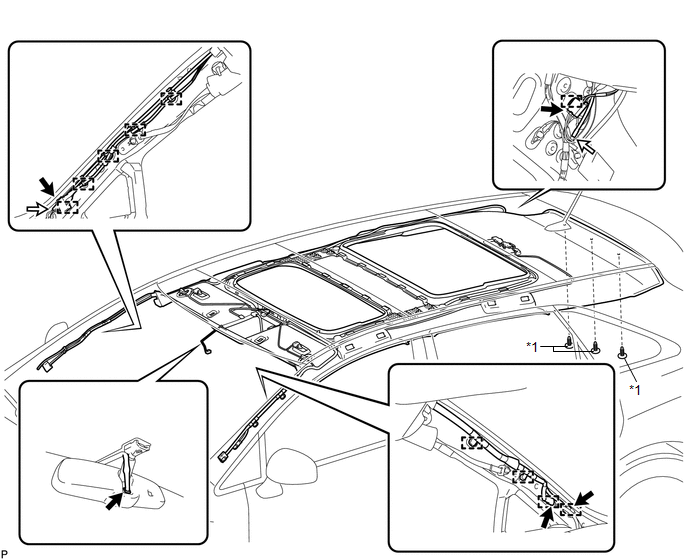 (c) Install the deck trim side panel assembly LH with the bolt and clip. 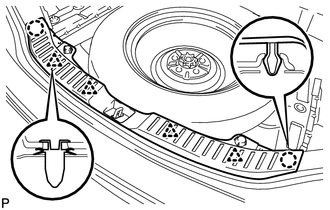 (b) Install the 2 luggage hold belt striker assemblies with the 2 bolts. (a) Engage the 3 claws to install the reclining remote control bezel LH. (b) Engage the 7 claws and the 6 clips. 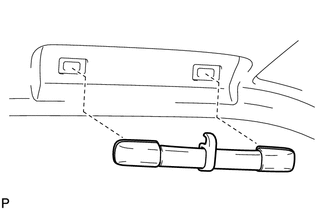 (c) Install the deck trim side panel assembly RH with the bolt and clip. 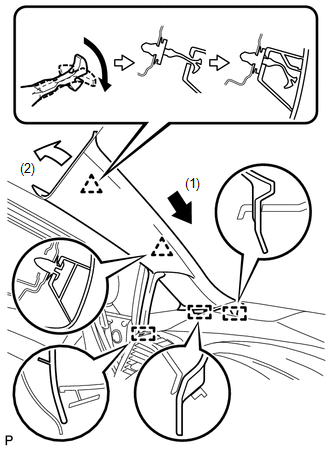 (a) Engage the 4 clips and 2 claws to install the rear floor finish plate. 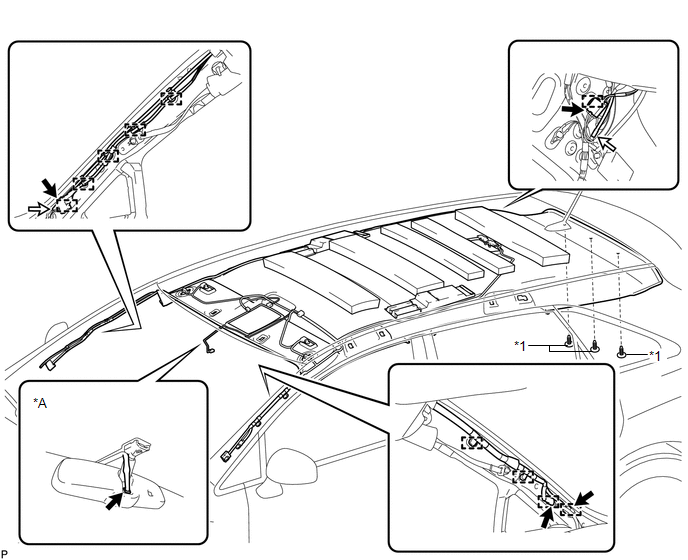 (a) Engage the 2 guides, 2 claws and 5 clips to install the rear seat sub floor panel assembly. 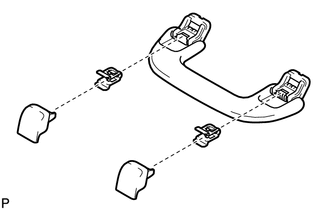 (a) Engage the 6 clips to install the No. 1 deck board. 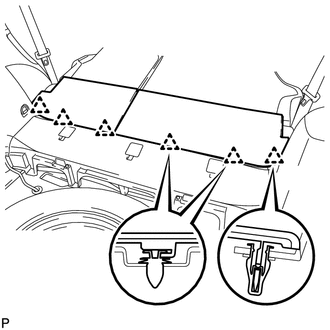 (a) Install the deck side trim box RH with the 4 clips. 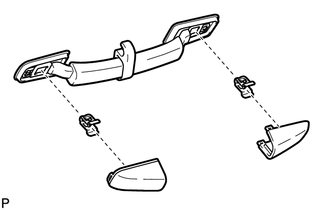 (a) Engage the 2 guides to install the No. 2 deck board sub-assembly. (a) Install the deck side trim box LH with the 3 clips. 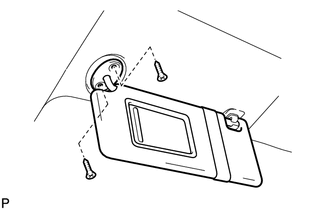 (a) Engage the 2 guides to install the No. 3 deck board sub-assembly. 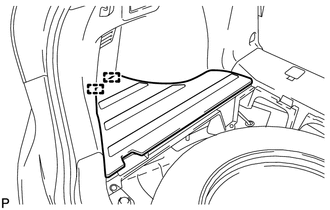 (a) Engage the 2 guides to install the deck board assembly. 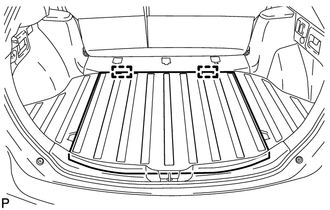 (a) Install the tonneau cover assembly. 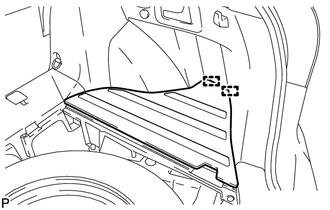 (a) Pass the floor anchor of the front seat outer belt assembly LH through the upper center pillar garnish LH. 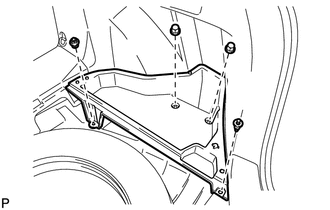 (c) Install the upper center pillar garnish LH with the screw. 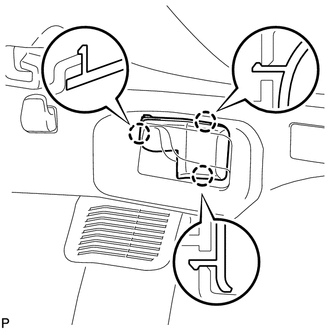 (a) Engage the guide, 2 claws and the 2 clips to install the lower center pillar garnish LH as shown in the illustration. 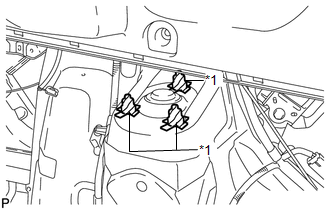 (a) Align the alignment mark (Purple) on the weatherstrip with the protruding portion on the body indicated by the arrow in the illustration, and install the rear door opening trim weatherstrip LH. After installation, check that the corners fit correctly. 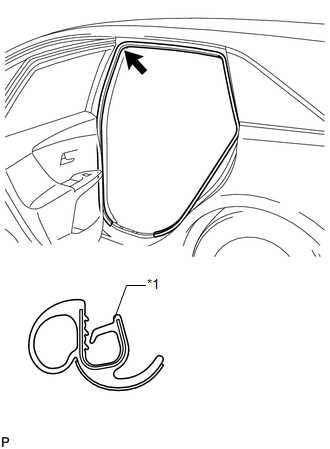 (a) Engage the 2 clips and 6 claws to install the rear door scuff plate LH. 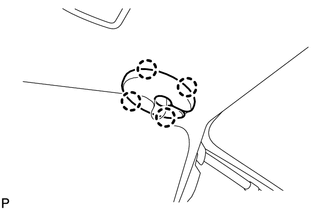 (a) Engage the 3 guides. 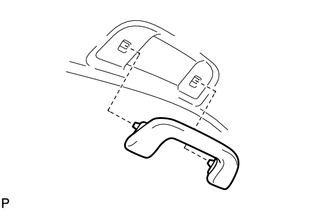 (b) Turn the end of the front pillar garnish clip 90° with needle-nosed pliers and install it to the front pillar garnish RH. 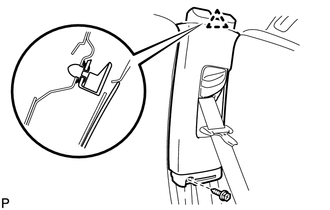 Tape the needle-nosed pliers tips before use. 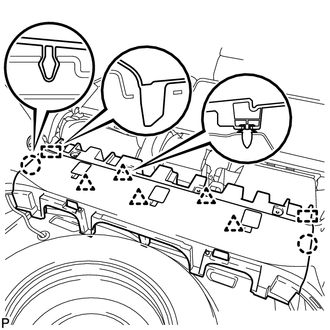 (c) Engage the 2 clips to install the front pillar garnish LH. 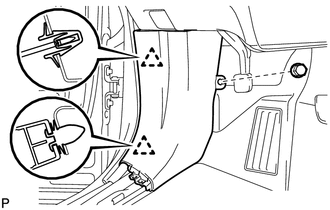 (a) Align the alignment mark (Yellow) on the weatherstrip with the protruding portion on the body indicated by the arrow in the illustration, and install the front door opening trim weatherstrip LH. 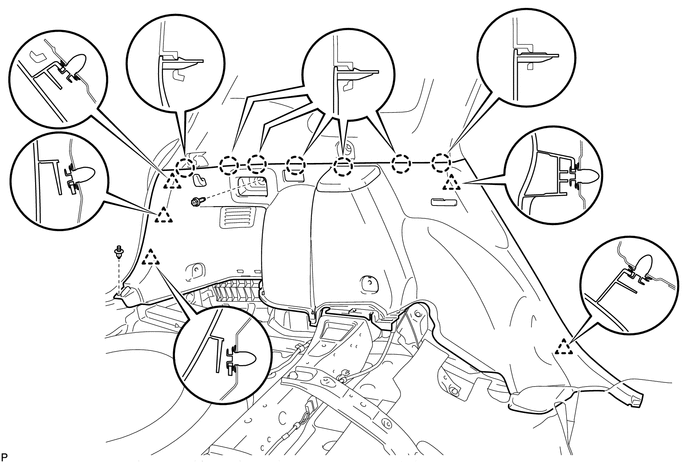 (a) Engage the 2 clips to install the cowl side trim sub-assembly LH. 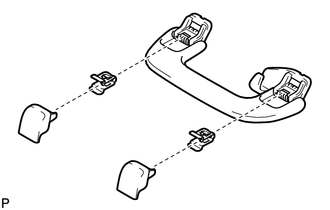 (a) Engage the guide, 3 clips and the 7 claws to install the front door scuff plate LH. 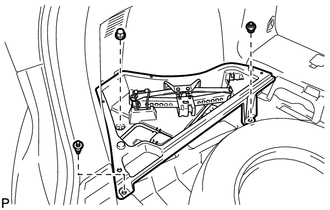 (a) Align the alignment mark (Pink) on the weatherstrip with the protruding portion on the body indicated by the arrow in the illustration, and install the rear door opening trim weatherstrip RH. 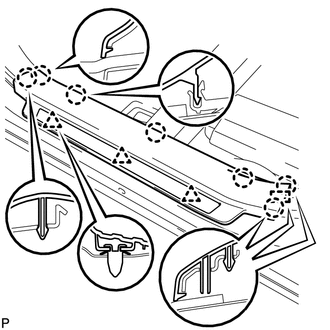 (a) Align the alignment mark (White) on the weatherstrip with the protruding portion on the body indicated by the arrow in the illustration, and install the front door opening trim weatherstrip RH.